1. Living in a single can be scary. I almost choked on a corn nut. 2. Shared restrooms are not so bad. Despite living on a floor with roughly 25 girls, I rarely run into other people in the bathroom. 3. Volunteering is a good way to get involved with PSU. Volunteering at the Women’s Resource Center gives me the chance to help do important work in a friendly environment. 4. Yes, I CAN put off all the homework for my 400-level Honors seminar until the night before it is due. 5. College sports can be super fun. On a whim, I joined rugby, and you could say I’m having a BALL. 6. If while studying in the library, someone irritates you by loudly talking on the phone, DO NOT passive-aggressively write “SHHHH, IT’S A LIBRARY” on their notebook while they’re at the water fountain. Go to the fourth, fifth floors or the basement, they are designated for silent study! 7. You can have small class sizes even at Oregon’s biggest university. Last year, my classes had 30 students. This fall, I’m in a class of ten 10 (and the rest aren’t much bigger). 8. Unlike the “cool kids” in my building, I still love my meal plan. 9. 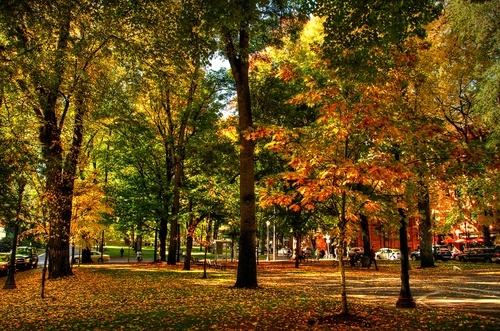 Nothing is more beautiful than the Park Blocks in autumn. I think it’s awesome that you joined rugby! Thanks! Yesterday, PSU Women’s Rugby started out the season by winning in a tournament against Western Oregon University, Humboldt and Lewis & Clark. Looks like all of us rookies are proving to be helpful, after all.